Reiki Practice: Magic or Medicine? You don’t need much experience with Reiki practice to know the results can seem magical. But does that make it magic? The improvements that come with Reiki are medically documented–improved breathing, heart rate, blood pressure and heart rate variability. But does that make it medicine? If Reiki were magic, we’d need a single treatment and all would be well. It’s true one Reiki session can bring amazing improvement, but we’re smart enough to know it takes more than a single Reiki session to maintain our health and well-being. To stay happy and healthy, we need Reiki treatment consistently, a daily “dose” if you will. But there are many things we need every day–food, sleep, hugs. Our daily need doesn’t make any of them–or Reiki–medicine. Medicine addresses your body and perhaps your mind and emotions. Reiki practice does all that, and restores your spirit. So if Reiki’s neither magic nor medicine, what is it? Reiki is a practice. Of course that’s a comment I’m always happy to read. I was intrigued about the details and asked to know more because hearing what makes the difference for different people helps me improve as a teacher. Your body responds with predictable physiologic changes when you practice Reiki. Reiki practice accelerates the natural course of healing not magically, but by optimizing your body’s ability to heal. Reiki helps us get (our minds) out of the way so we can heal on every level, body, mind and spirit. You know that soothing feeling, that sense of safety you often feel when practicing Reiki? That’s not measurable the way physiologic changes in breathing, heart rate and blood pressure are, but it is significant. Feeling safe feels better. And feeling safe changes your biochemistry. First you stop hurting yourself. (Today only, do not worry, do not anger.) Then you open to positive emotional states such as gratitude and compassion that have been shown to strengthen your health and bring out the best in you — your very best YOU, the one you so enjoy being. 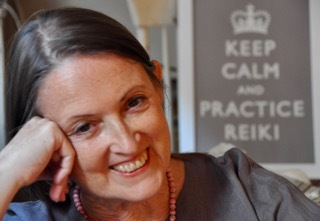 Yes, self Reiki practice requires training, and that involves an initial cost. (I hope you took the time to make a good choice.) You likely earned that money back the first time you didn’t have to pay someone else for care because your Reiki self practice was more than enough to get you back on your feet–or prevent you from being sidelined by illness. PLEASE NOTE: First degree training is all most people need. You don’t have to keep investing in training if your goal is to practice on yourself, family, friends and your animals. 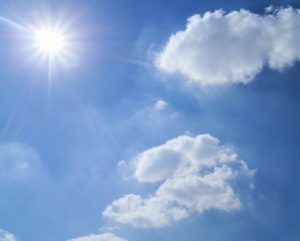 Of course people who want to become Reiki professionals need more training, but first they need at least a year of daily self practice to strengthen their well-being and begin to understand the depth of what happens during Reiki practice so they can support and guide clients realistically and practically. But you can only accrue the profound, continuing dividends of your initial investment in training with a daily, continuing investment of time. Your investment in self Reiki practice yields both quick dividends–you start feeling better within minutes–and long range improvement in your happiness and health. How has your Reiki practice helped you? I bet you can think of three things right off the top of your head, things such as improved sleep, digestion, focus, sense of purpose and social satisfaction. Have you ever wondered how exactly that happens? While we don’t know why the touch of a Reiki-trained hand elicits such a profound self-healing response, we know quite a bit about what happens and why it matters. When you practice, you’re setting aside time to reverse the ravages of stress. Yes, your stress. Ignoring the amount of stress you live with doesn’t mean it hurts you less. You also give your body access to the full array of self-healing systems that shut down under prolonged stress. Your body comes back to itself as you practice every day, and you benefit from the gentle yet deep cleansing and healing that the body needs every day. That’s something worth investing 30 minutes a day. Especially when you can be in bed half asleep as you practice. So why not give it a try? If you were never taught self Reiki practice, click here for a helpful article. 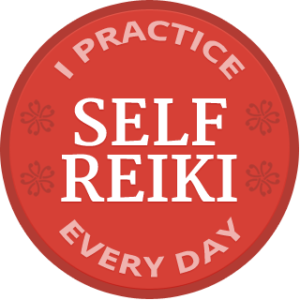 And if you fall in love with your daily self practice, grab your free I Practice Self Reiki Everyday digital badge, in English or more than 30 other languages! 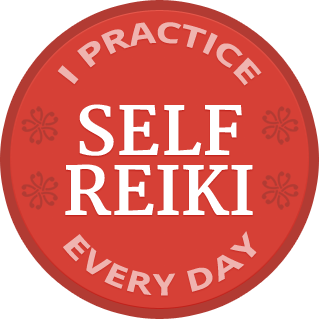 Add it to your Facebook page, your email, your website–anywhere you want to start a conversation about the difference Reiki practice has made in your life! The Reiki & Medicine Intensive gives you what you need to present a compelling and logical case for Reiki practice to anyone, including doctors, nurses and other healthcare professionals–and any other reasonable skeptic, family-member or otherwise. You’ll leave full of enthusiasm and knowledge about how current medical science supports the value of Reiki practice, and how to communicate that. Check the current intensive schedule here. I am thrilled to be invited back to offer the BLESSED BOUNDARIES: Living from Choice in-person spiritual retreat (I’ve offered the online program for several years). Our time will be sweet and transformative. The retreat is open to everyone, whether or not you practice Reiki. Register here. Thank you for your consistent reminders to practice self Reiki. I remember writing about my self Reiki experience during the Reiki in Hospitals Intensive in NYC with you, such an important part of the whole experience. You inspired me to be more consistent in my self practice. The precepts along with daily self practice, so good! What a great article! I had my first reiki attunement 4 years ago and have stopped doing my daily practice. This has inspired me to get back at it! I might have to go for my next attunement. Wonderful, Luis! I love to read that people have returned to daily self practice. But why go for another initiation? First degree is enough for most people. Your practice gets stronger primarily through daily self practice, not by taking more initiations. Hey Pam, when are you coming to Argentina? I taught in Buenos Aires and Salta in 2010 (as I recall) and loved Argentina. I don’t have plans to return but am always open to invitations. Thank you for your interest! You are amazing …. bless you.